We’re big science lovers, so we always try to take everything we do to a STEM-themed place. 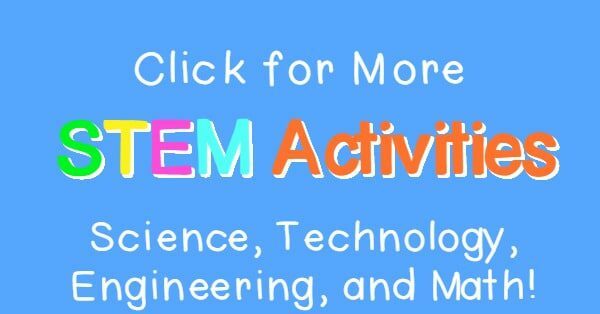 We have tons of STEM activity ideas to try, but one of our favorites is our latest! In this STEM activity, Monkey wanted to know if we could build a real-life Creeper that could really explode. I wanted to find a way to do it safely. The compromise was the classic Alka Seltzer rockets experiment! 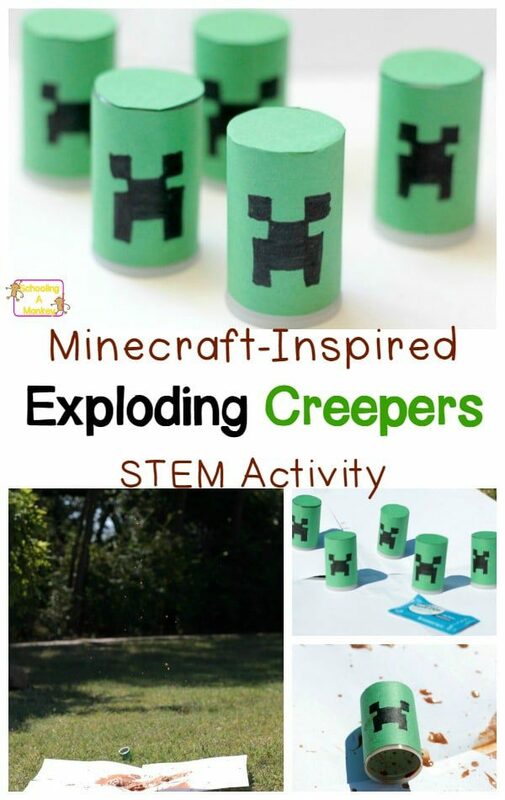 Combine Minecraft with real-world science when you make Creeper-inspired alka seltzer rockets! 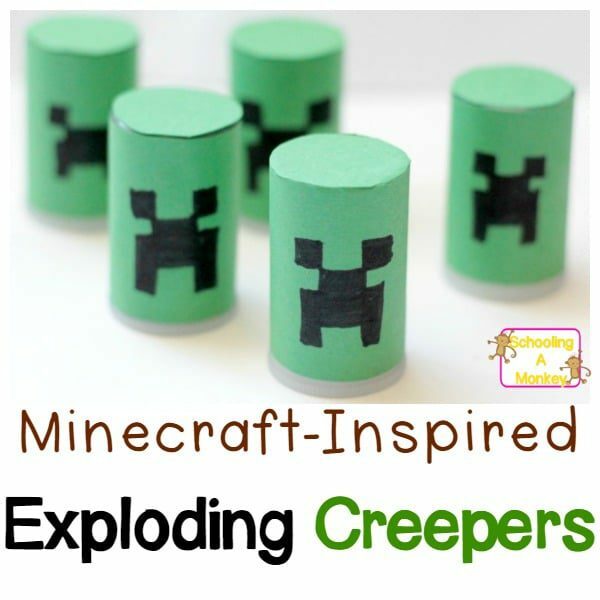 Your kids will love making their own explosive Creepers. First, give your film canisters a Creeper coating. We did this by measuring how long the canister was and creating a little green construction paper “jacket” for each canister. We also traced the bottom of the canister and cut out a green circle so the entire canister (except for the bottom) was covered in green paper. Use a glue stick to glue the paper to the canister. 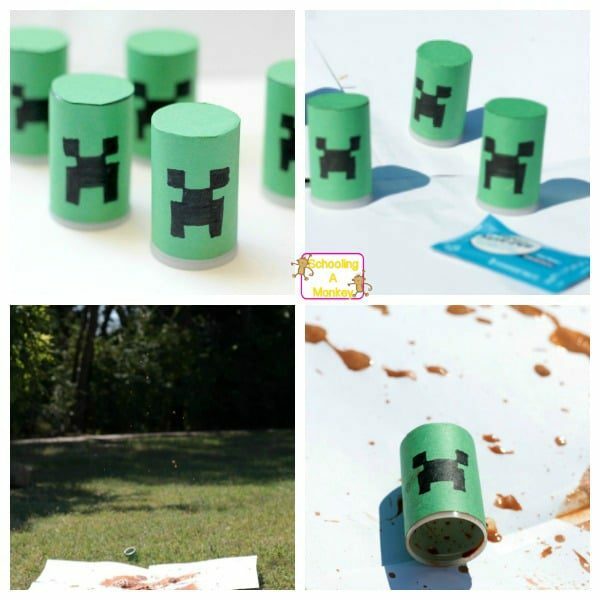 Draw a Creeper face onto each canister. The basic Creeper face is a small rectangle for the nose, then two small rectangles come down from the nose to make the mouth. Two squares at the corner of the nose make the eyes. Take a look at the picture if you need more help. After the Creepers are dressed and ready, mix up your “dirt” that the creepers will explode. We used a mixture of about 40 percent water and 60 percent brown paint. Add about a 1/2 of an inch of the pain mixture to each film canister and seal the lids tightly. 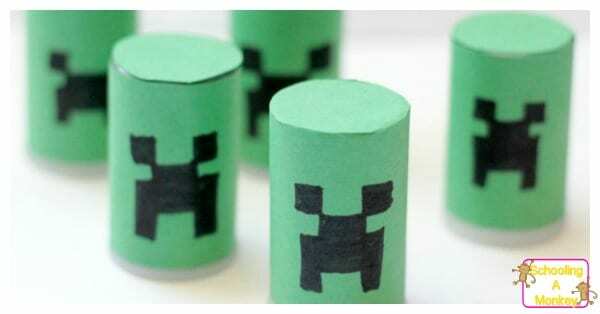 Spread the Creepers onto the grass or on butcher paper for a more dramatic effect. Put on your safety glasses, just in case. Drop an alka seltzer tablet into each Creeper container and quickly seal the container. Step back and watch the Creepers explode! The brown paint splatters will look just like the little bits of dirt Creepers leave behind in Minecraft. Alka seltzer is almost exactly like the classic baking soda and vinegar experiment. Alka seltzer contains baking soda and citric acid, which, when dry, won’t react. But as soon as water is added, the mixture fizzes and creates carbon dioxide gas. With enough pressure build-up, the tops pop off the film canisters and the Creepers explode into the air. 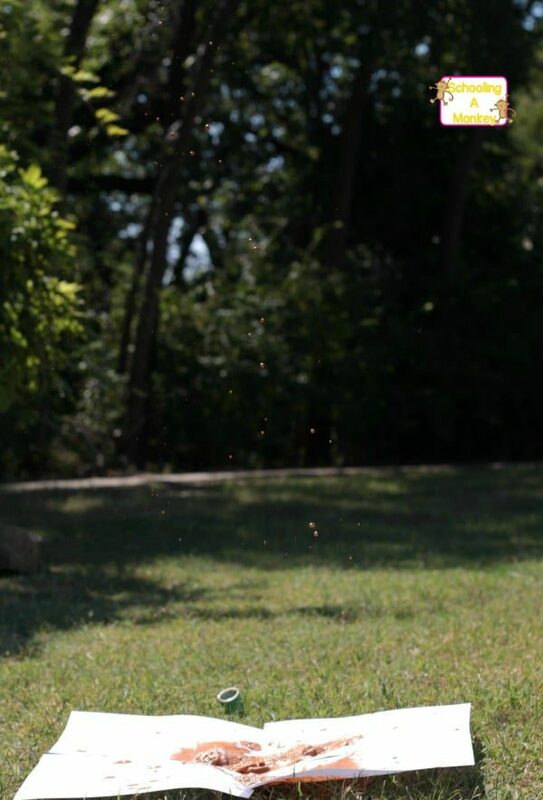 Science: Learn about what causes the rockets to soar high into the air. Will the temperature of the water change how high it flies? Technology: Use measuring tools to measure how far the rockets fly! Or play Minecraft and face Ceepers in the wild. Math: Measure how far the creepers fly. Do they go farther with differing levels of Alka Seltzer or water?